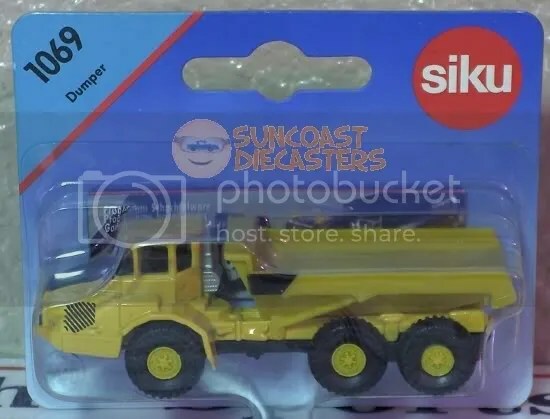 Big Tractor Mike’s Collection of Construction Collectibles! 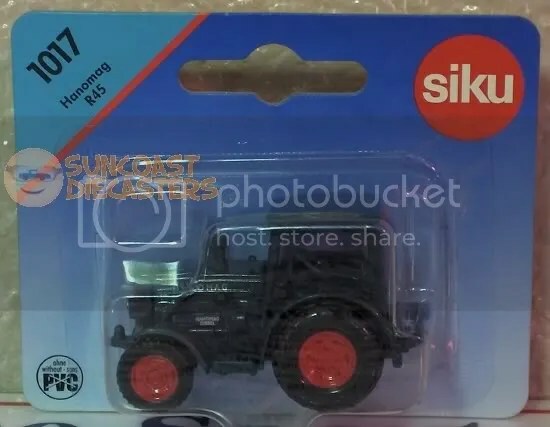 BTM’s collection starts off with this nice series of Siku roadwork miniatures, courtesy Ken. Below is the Hamm HD 90 Road Roller. …Well, except it isn’t articulated. Still, it’s a nicely-rendered model. 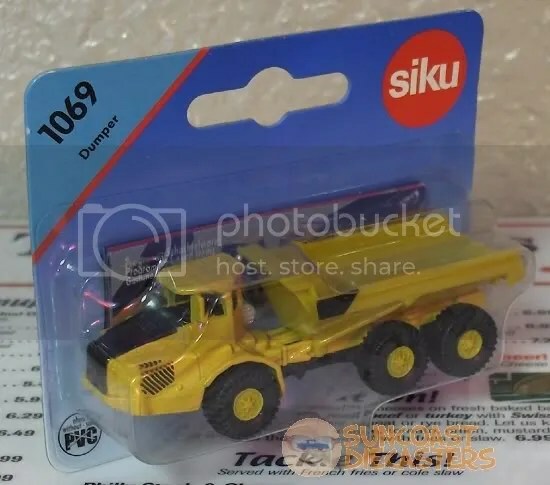 Seems to be from Volvo’s E-series of articulated dumpers, but I can’t ID the specific model. These two VW campers are Matchbox Superfast. The blue one has a variation of having a gas filler cap on the side — sadly (says BTM), this is not that variation. Groovy, man! I’ll get my bongos! The red fellow is the Cedric fire chief wagon, by Tomica. Its rear hatch is missing, yet surprisingly its bubblegum dome light, sirens and even its fender speaker are still intact! The odd-looking blue fellow in back is Monster, by Johnny Lightning. I had a few JLs which could be customized via snap-on parts, and as Monster seemed to be lacking some parts, I hit the ‘Web for info, presuming it was of the same species. Much to my surprise, I learned that Monster is an entirely different sort of beast, as it were — specifically, a jet-powered beast! In 1970, JL launched its short-lived “Jet Power” line, which was cars featuring a special interior cavity designed to hold compressed air, and the “Power Compressor” accesory which is (er, was) used to pump up the cars. Each car had a little flip lever on the rear which would release the compressed air, thus “jeting” the car. Monster was the car included with the Power Compressor. 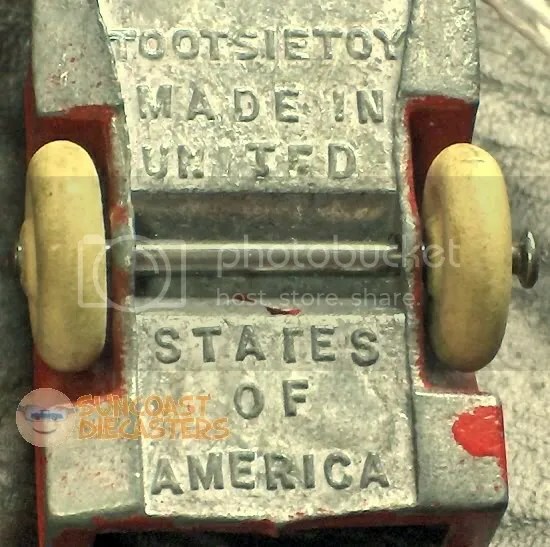 …And classic TootsieToy anonymous pick-up truck. Note the classic white rubber tires. 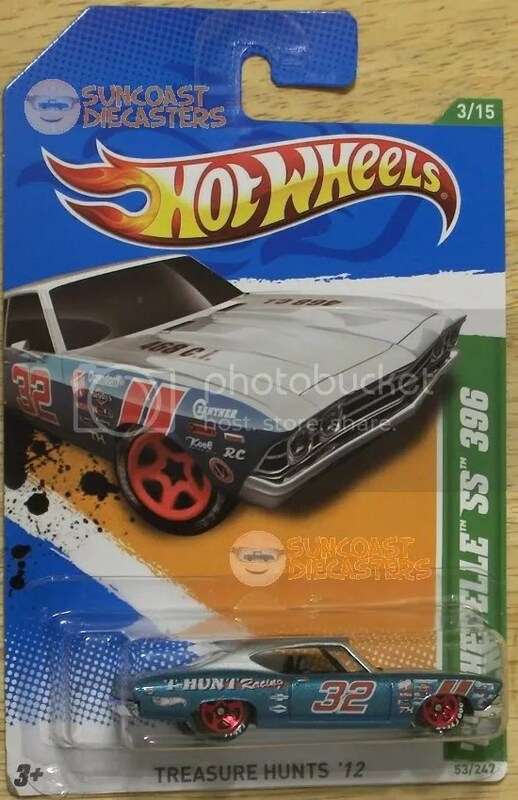 This nostalgic element was reflected well on the Treasure Hunt version of Hot Wheels’ Old Number 5.5. They, *literally*, don’t make ’em like this anymore…. 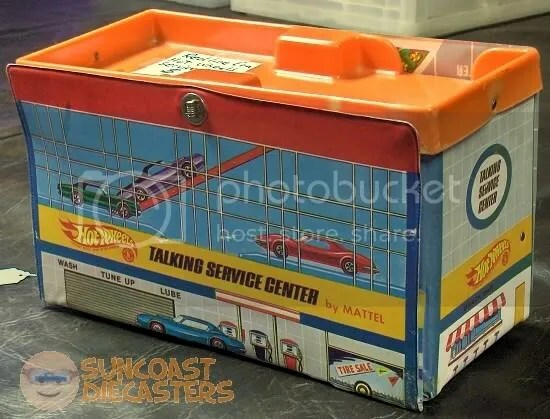 For all you young whipper-snappers with your iPads and your Sony Walkmans and your portable I don’t know what else, feast your jaded eyes on this: the 1968 Hot Wheels Talking Service Center (“by Mattel!®”). 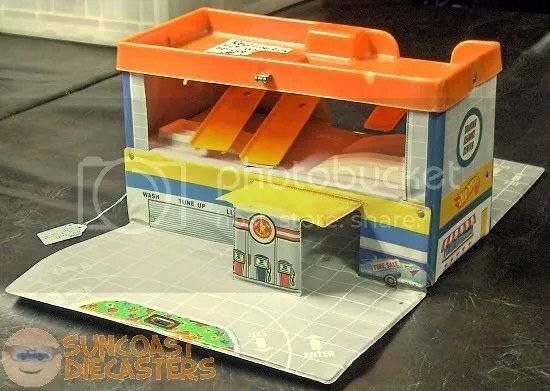 Yeah, you have your highly-detailed playsets made of high-impact styrene plastic, with action features and LEDs and digitally-stored sound effects and character audio. But in our day, we had this!! Cheap, thin vacuum-molded plastic for the second floor and roof, while everything else was folded cardboard wrapped in printed vinyl. That’s right, I said folded cardboard wrapped in printed vinyl. And we liked it! NOW GET OFF MY LAWN!!! Oh, you’re wondering how it talked. Well, ya long-haired brat, ya see that plastic ring on the string in the right side of the picture? That. That is how it talked. You pull the string, and a little sealed phonograph inside played one of ten recordings of greasemonkey audio and car sound effects. Yes, I said a little sealed phonograph inside. And no, this one doesn’t work anymore. And I swear, if I hear you giggling just once more, I’m gonna come at you with a rolled-up newspaper. Mike’s collecting interests are primarily construction vehicles & machines; Micro Machines; and vintage models. In other words, stuff that hardly ever shows up in my collection. 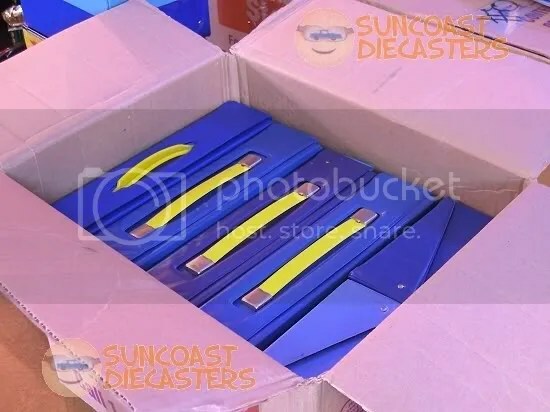 Thus, while I’ve traded back ‘n forth with other Suncoast Diecasters members, it’s usually one-way from Mike to me. So, I was very pleasantly surprised when Mike chose this T-Hunt from my table, a rare me-to-him trade. I even tried to RAOK it when he picked it up, but he threatened violence if I refused to take his green, so I begrudgingly accepted his cash and kept my skull intact. So, this guy walks into the August meeting, and asks Big Tractor Mike about membership and et cetera. Mentions something about cars and stuff his parents collected and put away for him when he was a kid. Goes back out, and brings in the most awesomely huge collection of Redlines and accessories and stuff that I done ever did see! BTM starts goin’ through a case, and pulls out a few cool finds. Me does the same thing. Eventually he gets his wits about him, does some math in his head, makes Mr. New Guy an offer … and ends up buying the Whole. Incredible. Collection., in One. Huge. Single. Drop. 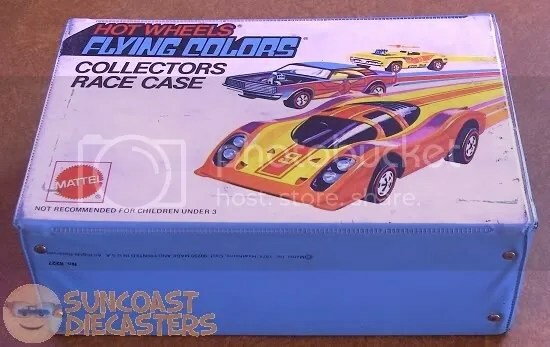 Amongst BTM’s newly-purchased prizes is this box full of cases, each of which is full of cars. Let me type that again slowly for those of you who missed it the first time: Every one of these cases is completely full. Let’s have fun with numbers: That’s four 48-car cases, and two 24-car cases. So, that’s (4 x 48) + (2 x 24) = 192 + 48 = 240 hardly-ever-touched genuine classics, in one box. There’s a word for this, y’know: AwweSOMMMMME!!! …Aaaand the cases above aren’t the end of it. Here’s another, believed by archeologists to be from the Flying Colors era. Oh, and yes: it too is full of cars. 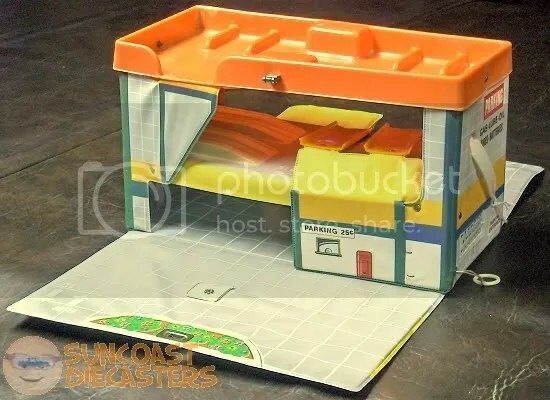 A specific find: Personen Kraftwagen, by Playart. 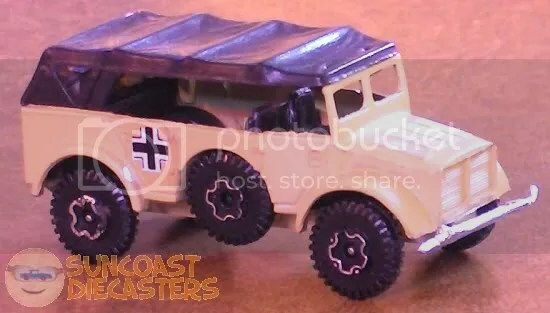 I don’t know how (comparatively) rare this tan version is, but when I went online looking for info, most other collectors’ photos were of the olive drab version. A specific find: Upfront 924, more specifically from the 1983 Extras Series. 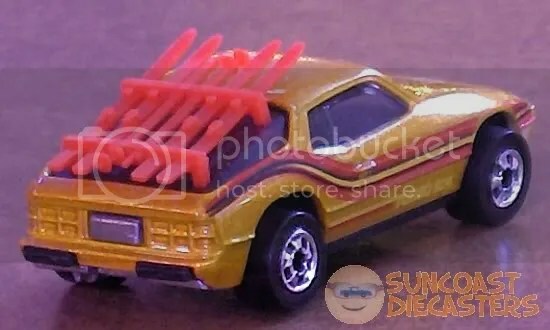 Extremely rare version with nicely-detailed ski rack. 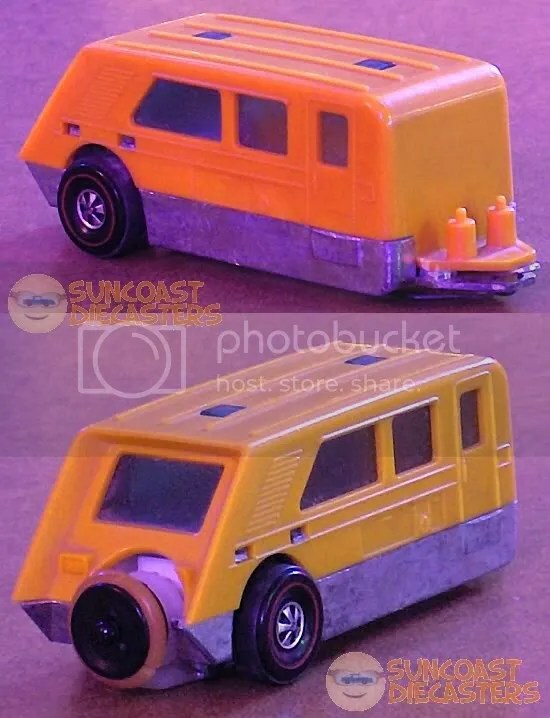 A specific find: WigWam-Van Camper, by Corgi. Not much info online about it, beside what you’ve just read and seller valuations. Very cool and wild custom, with nice interior detail. A specific find — and what a find! This is truly among The Rarest of The Rare: The Revvers Camper. 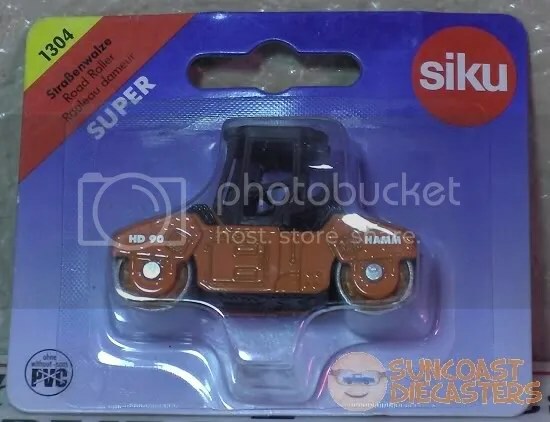 This is one of the most rare Hot Wheels items (not to mention toys in general), and Mike was just about all jittery when he pulled it out of the case. Ya done well, Mike. Mike did very well at our March ’13 meeting, picking up this great-looking Hi-Rakers Dodge D-50 and this also great-looking — though somewhat unbuckled — Bedford Car Transporter. 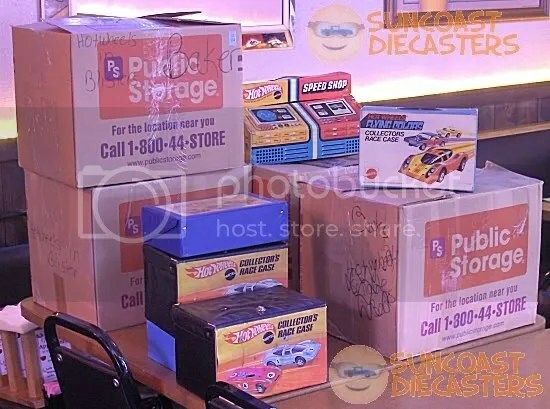 April ’13: Mike picks up a rare ’83 Extras-series Sunagon, and a rare Revvers-series Buzzin’ Bomb.